Casting directors of Hong Kong Disneyland are scouting for vocalists to portray various prominent Disney princesses. Aside from the competitive salary and the magical Disney experience, benefits will include a roundtrip airfare, individual housing with paid utilities, shuttle service for work transportation, medical and dental coverage, paid vacation and sick days, and a daily allowance. They want singers who have a vibrant and vivid charisma and stage presence. All of the talents must have a strong upper body. They are currently offering the role of Merida to a 5′ 5”–5′ 8” female singer. Your vocal range should be from A below middle C to C# (octave above middle C). Meanwhile, they are also looking for someone who can play both the roles of Rapunzel and Elsa. You must have a height of 5′ 6”–5′ 9” with a G-below-middle-C-to-E (10th above middle C) voice. Another talent is sought who can depict either Ariel or Elsa. You must stand within the height range of 5′ 6”–5′ 9′. You should also be able to hit G below middle C to E (10th above middle C). Lastly, the character of Tiana is available. Those who want to apply must be 5”–5′ 8” in height and must have a vocal range of G below middle C to E (10th above middle C). 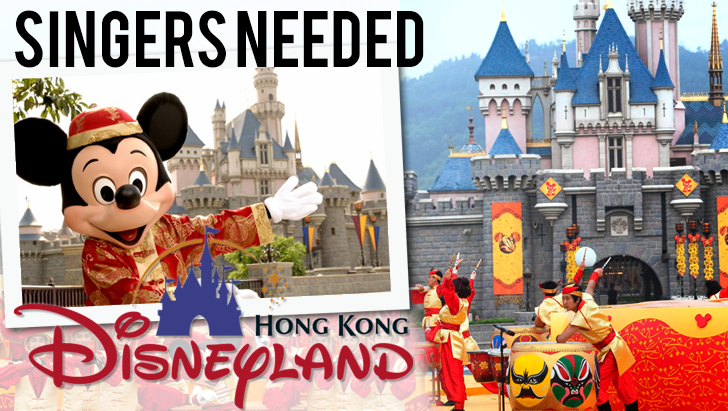 Also note that selected talents will be working in Hong Kong Disneyland, so make sure that you are willing to relocate to Hong Kong in the fall of 2015 for the entire duration of your contract. If you match the criteria above and if you accept the terms stated above, you can attend their audition on May 11, 2015, at 1:30 p.m.
To find out more about the job, simply click on the ‘Apply for This Job’ button below. Performer traits: Strong dynamic and expressive presence with Principal qualities. Mover with strong upper body / arm presence. Vocal range: A (below middle C) to C# (octave above middle C). Pop Sound. Performer traits: Strong dynamic and expressive presence with Principal qualities. Mover with strong upper body / arm presence. Vocal range: G (below middle C) to E (10th above middle C). Performer traits: Strong dynamic and expressive presence with Principal qualities. Mover with strong upper body / arm presence. Vocal range for Ariel: G (below middle C) to E (10th above middle C). Performer traits: Expressive face and acting abilities with Principle qualities. Strong mover with good upper body and arm presence. Vocal range: G (below middle C) to E (10th above middle C).